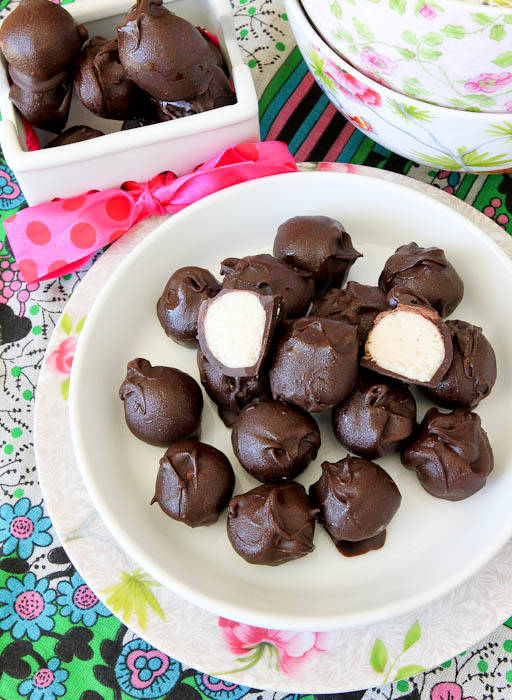 Sometimes you need to get your chocolate fix on without getting your gluttony on. And these are just the little bites to do it. There’s NO added white or brown sugar, NO butter or dairy, and NO flour used. 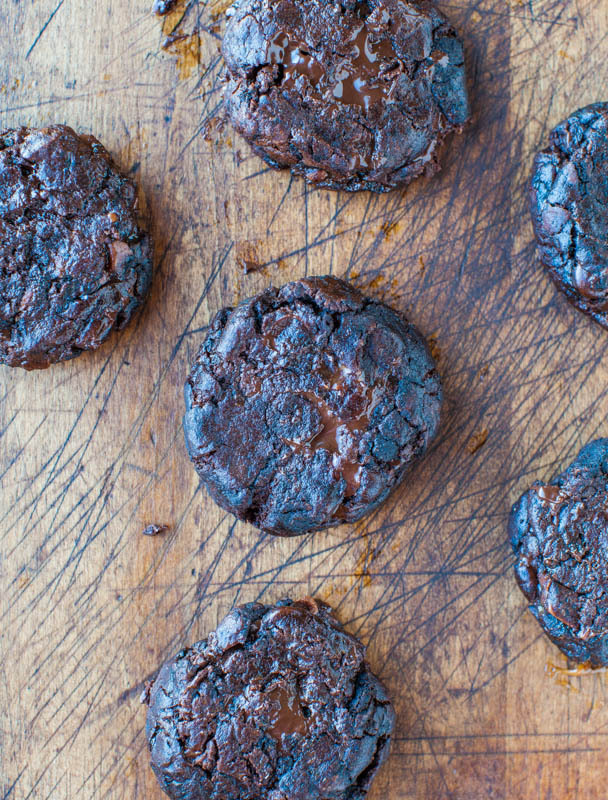 They’re vegan, gluten-free, grain-free, soy-free and you’d never guess they’re healthy. 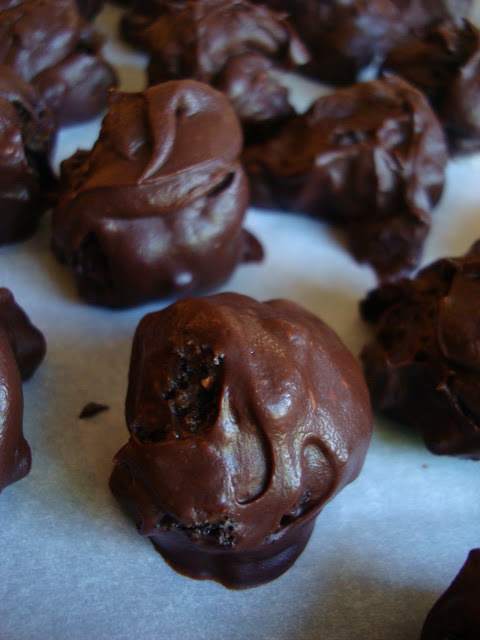 They’re a revamp of my 2009 Raw Vegan Dark Chocolate Fudge Balls and are made in minutes. Noteworthy changes include increasing the ratio of cocoa powder and adding a dash of agave. The net result is bites that taste even more like real brownies. 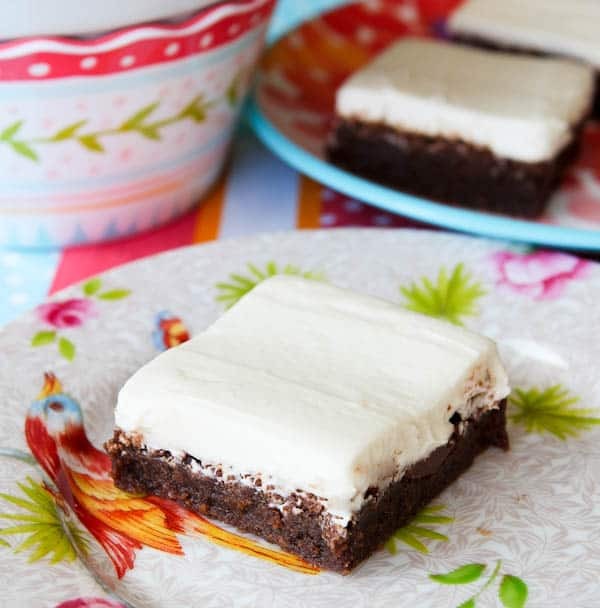 Rich, supremely fudgy, and satisfying. And are made entirely from plants. The new batch size is slightly larger, but still yields just 2 dozen small bites, about 3/4-inch to 1-inch in diameter. If you roll them larger, approaching golf ball size, one dozen is a realistic yield. I used cashews and highly recommend you do the same. Cashews are the vegan, plant-based equivalent of butter. They’re softer, richer, and creamier than other nuts. They blend smoother and are more flavor-neutral. I prefer cashew to almonds because almonds are chalkier, harder, coarser, don’t blend as easily, impart more nutty-flavor rather than buttery-flavor, and aren’t what I’d reach for. If my choice was almonds or peanuts, I’d go with peanuts. At least that way the finished bites would taste peanut buttery. This is a wet-ish dough, but it shouldn’t be sloppy wet, nor bordering on Chocolate Cashew Butter. If it is, you need to dry it out. Add more cocoa powder or nuts, one tablespoon at a time. In this batch size, one tablespoon makes a difference, so add slowly. If the dough is too dry and is sandy, moisten it either with an additional squirt of agave or another date or two. Because natural ingredients vary so widely; just how creamy or dry your cashews are, how soft and moist the dates are, and just how finely your food processor can pulverize, are all variables to account for. Use my recipe as a guideline, adding a pinch of this or squirt of that as necessary to get the dough to combine into a big softball that slaps around the interior of the food processor canister. If you have the choice of a food processor and a Vita-Mix, I prefer a food processor. Remove the dough, put it on a large plate or in a bowl, cover it, and allow it to chill for a few hours, up to a week, before attempting to roll it into balls. If it’s too warm, you’ll have a sticky, tacky, chocolate sauce-like paste all over your hands. Not the worst problem in the world, but rolling will be more annoying, stickier, and more time-consuming than it needs to be. Chilled dough is much easier to work with. 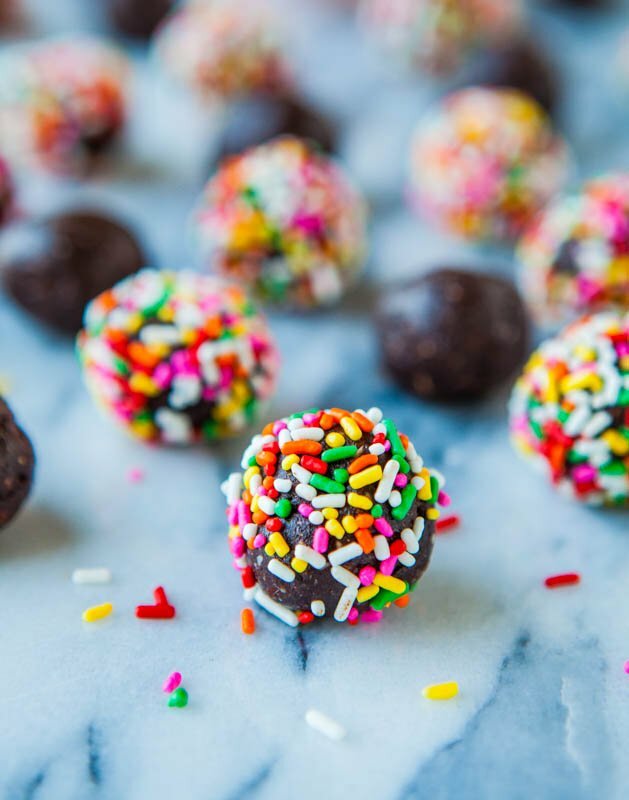 Optionally, dredge the bites through sprinkles. 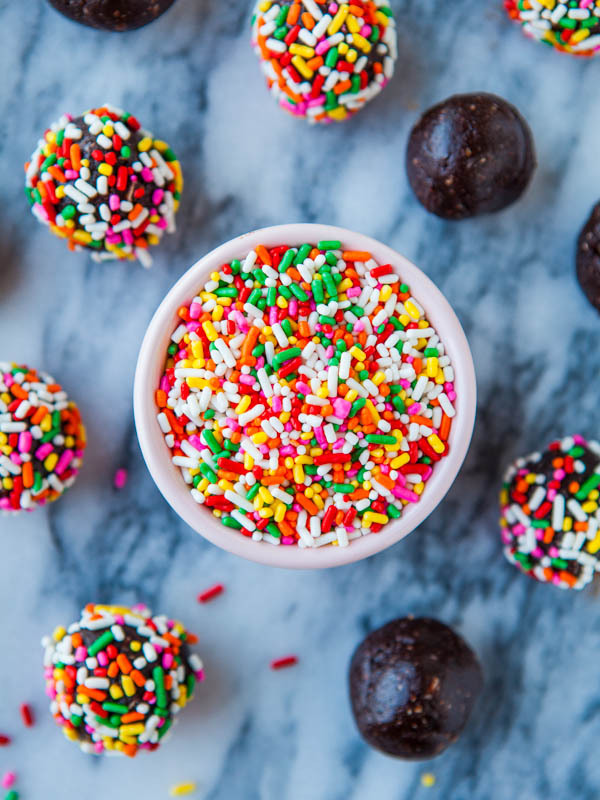 Only good things can come from sprinkles. 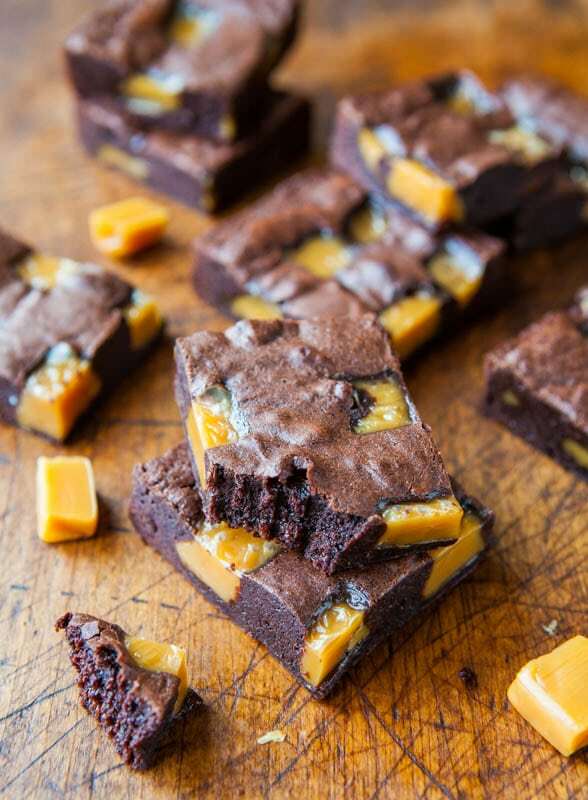 I wouldn’t say it if I didn’t truly think so, but they taste like rich, fudgy, full of eggs-and-butter and melted chocolate brownies. 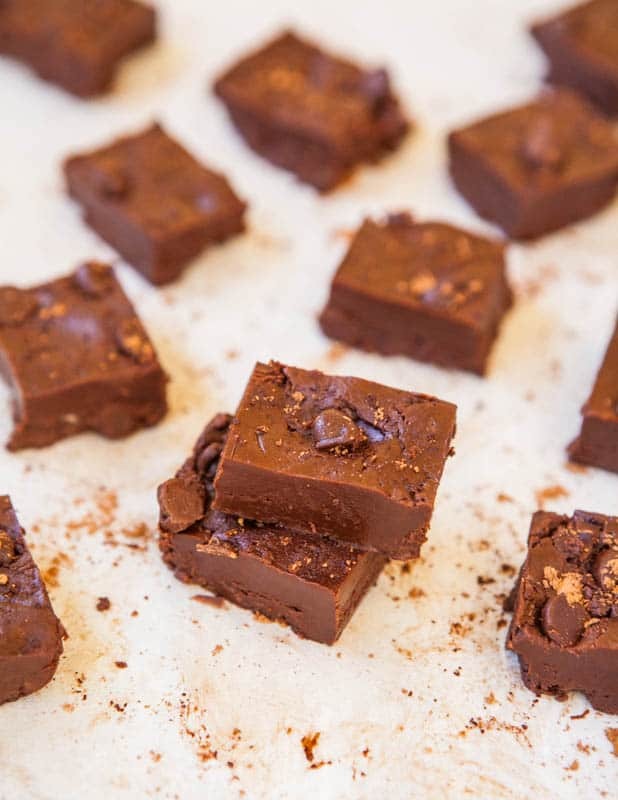 They pack some serious fudge factor and are dense, chewy, rich, and so satisfying. They keep for weeks, months really, in the refrigerator or freezer and it’s nice to have a dozen around to snack on. I have tupperwares full of dough balls in my fridge and freezer to be baked off or snacked on at a later date. Some is raw-vegan and some is the real thing. Unless I label it or have a clear memory of what I stashed, these healthy bites could easily get confused as the real thing. If you’ve never made a raw vegan chocolate treat before, or something that fools everyone, this is the one to try. 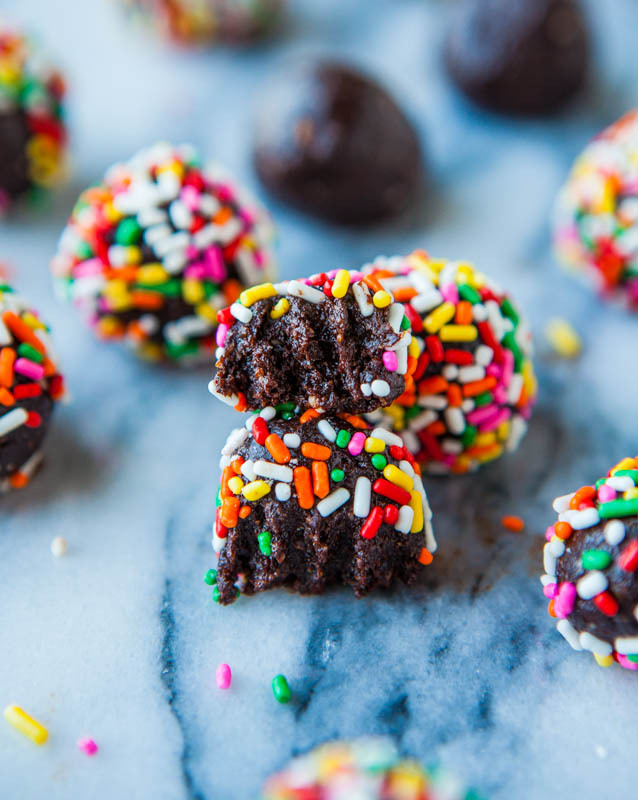 The bites remind me of 2009 when my blog was full of Dessert Bites, Balls, Cookie Dough, and Truffles Recipes. Things change, life moves on and ebbs and flows, but this recipe is full of nostalgia. And chocolate. I like to think of putting teeth marks into one of these is as guilt-free. 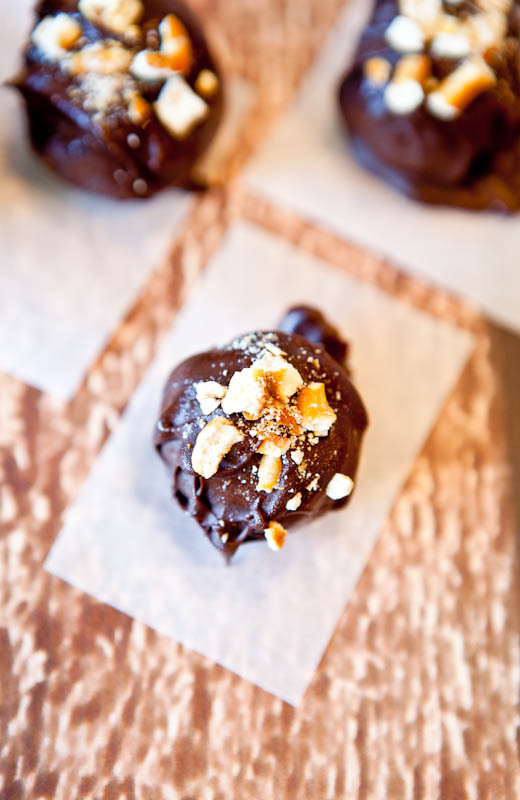 Get your chocolate on without getting your gluttony on. To the canister of a food processor or Vita-Mix (I prefer my food processor for this job), add the cashews, cocoa powder, and blend to pulverize into fine crumbs, about 15 seconds. Do not over-process because you will make chocolate-cashew butter very quickly. Add the dates, vanilla, and process until mixture begins to combine. It’s likely the mixture will be sandy, coarse and not combining. As necessary to get it to combine, add agave, one tablespoon at a time, pulsing to incorporate after each addition. You’ll know the consistency is right when the dough combines into a softball-sized mound and the mound travels around the canister in one big ball. It will still be tacky and sticky, but it shouldn’t be wet and sloppy. Dough that resembles the consistency of nut butter is too runny and loose and dry ingredients must be added to help it solidify. Add a tablespoon or two more cocoa powder or cashews, as necessary, to dry out the dough. Dough that’s too pebbly, dry, or sandy will benefit from anther couple dates or tablespoon of agave, as necessary, to moisten it. Transfer dough to a plate or bowl, cover with plasticwrap, and refrigerate for at least 2 hours, up to 1 week, before rolling into balls. Dough that’s warm is difficult to work with; it’s stickier, messier, and it leaves a chocolate paste-like layer on your hands. Wait until it’s chilled before pulling off small hunks and rolling between palms until smooth. Work quickly because the warmer the dough gets, the harder it is to roll. I roll the balls about 3/4-inch in diameter, up to 1-inch. 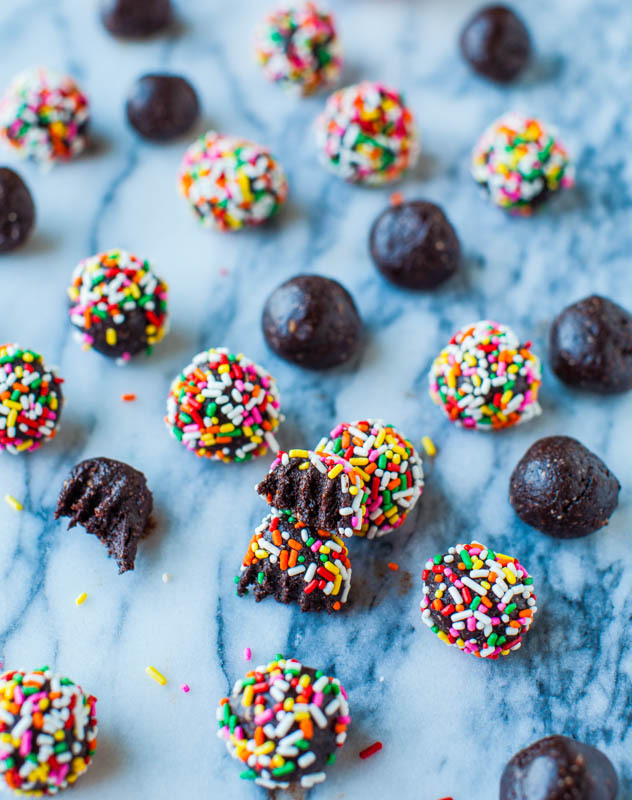 Optionally, dredge balls through sprinkles. This has the added benefit of absorbing some of the tackiness or stickiness of the dough. I prefer the bites chilled and store them in the refrigerator. Bites will keep in an airtight container at room temperature for many weeks, or in the refrigerator for many months, or in the freezer for 6+ months. 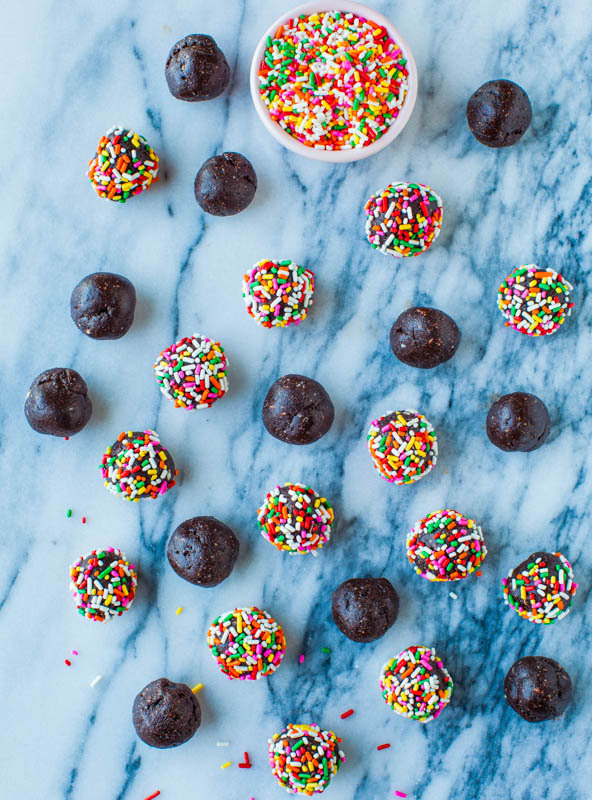 Have you ever made no-bake bites or balls? 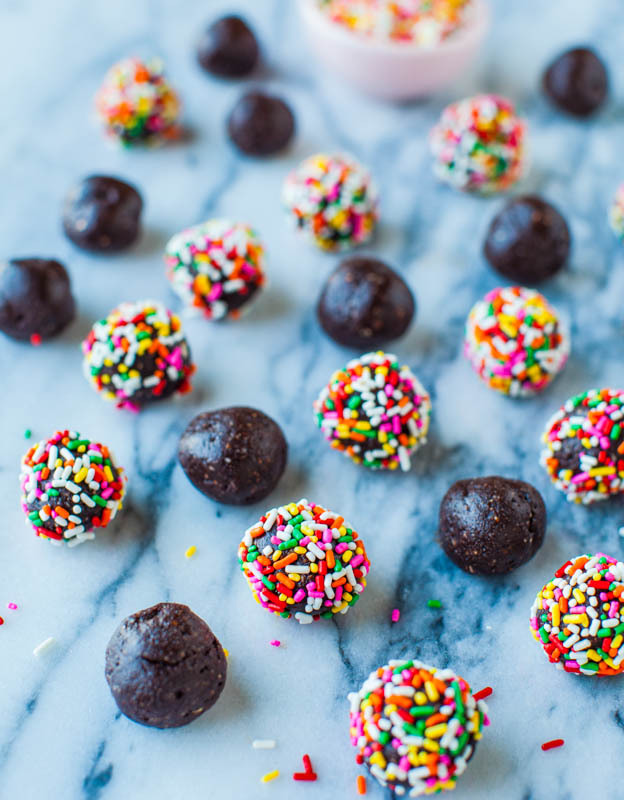 Making no-bake 40+ Dessert Bites, Balls, Cookie Dough, and Truffles is easy and there is no wrong way. Combining nuts or seeds with dates, raisins, or other dried fruit; sometimes adding peanut butter, agave, maple syrup or other glue-like ingredients, and blending them is always going to result in something wonderful. If you have favorite recipes, please share links. 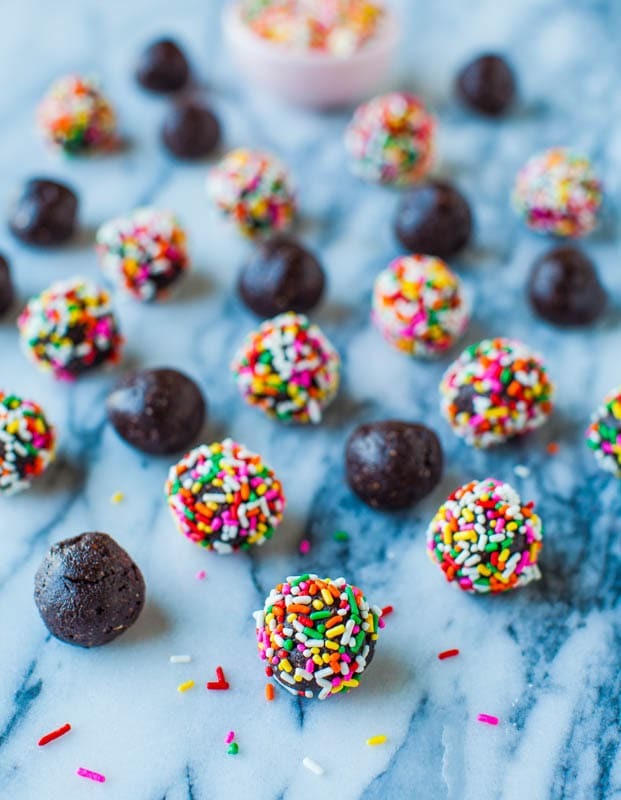 This recipe was SOOO healthy til you got to the sprinkles part. They are full of chemical artificial colors and flavor and other nasties ! 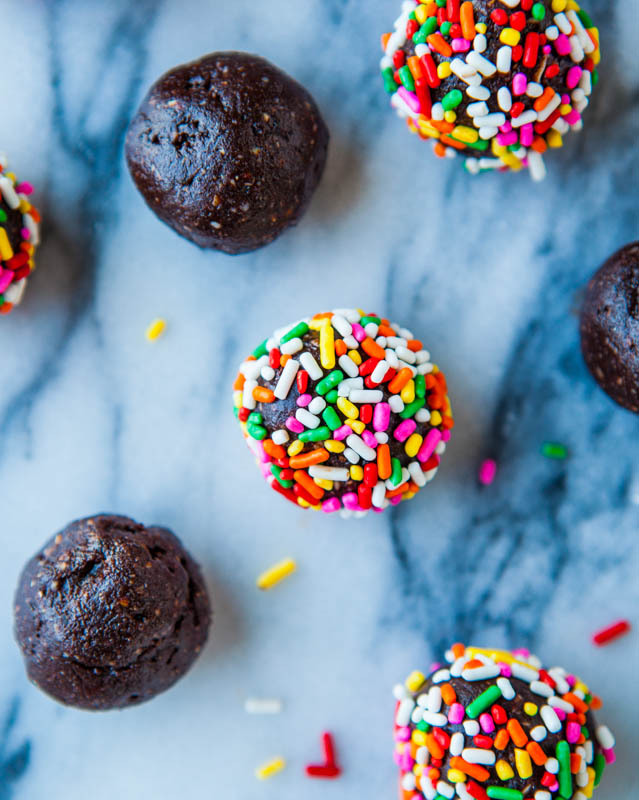 Roll in organic coconut or crushed nuts, sesame seeds, please, anything but sprinkles ! They make ‘healthy’ sprinkles; check your local WFs or similar store. 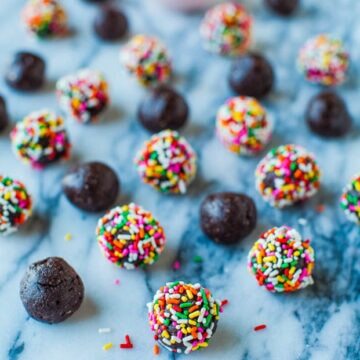 Gosh I’ve never broken any appliances making any no-bake balls and I’ve made a lot over the last decade! Sorry you were having such trouble! I don’t have any ‘tricks’ other than to throw the ingredients into the canister and turn the power switch on! 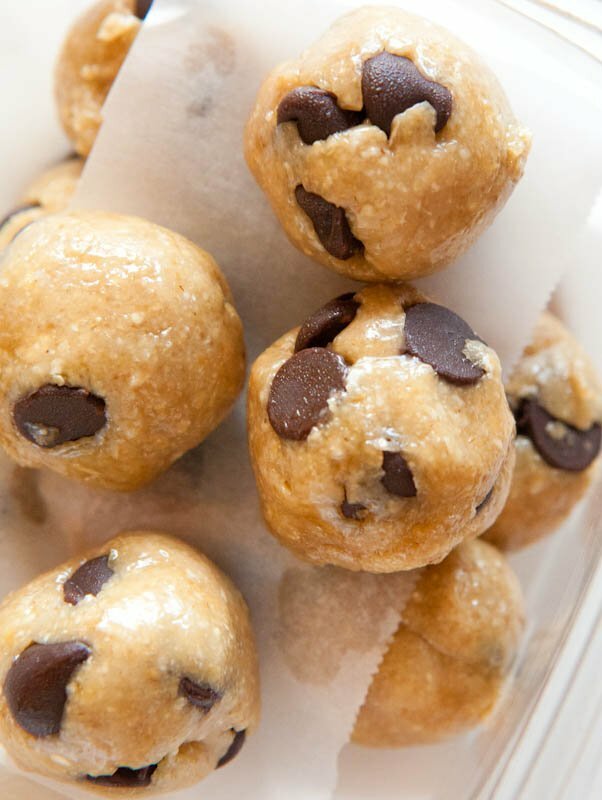 What makes you like your food processor over the vitamix for these? I tried them in my vitamix and temporarily shut the motor down. What kind of food processor do you use? Thanks!! What makes you like your food processor over the vitamix for these? = your experience with the Vita overheating & temp shutting down! Been there, tons. For stuff like this I use my food proc. 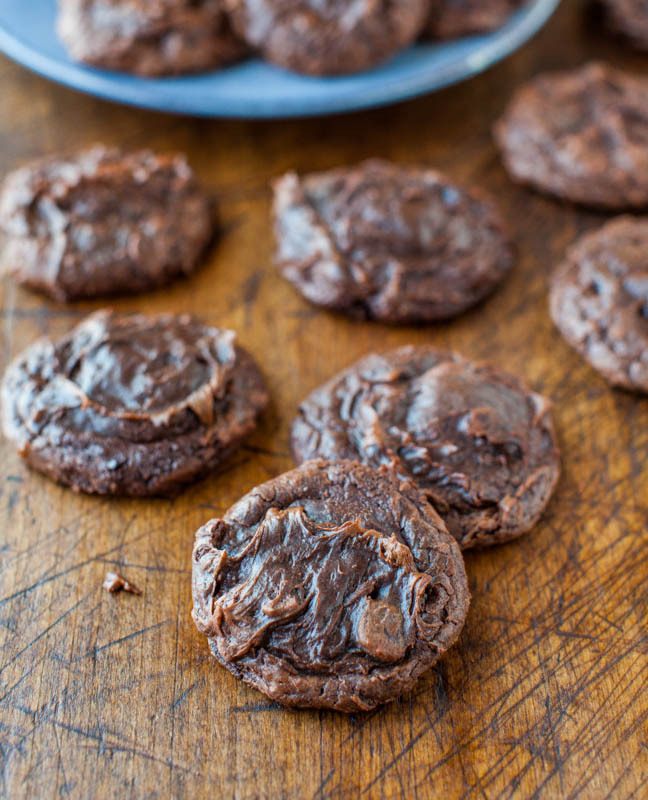 This is one of those great recipes you can happily add to your regular rotation- I’ve made it at least 5+ times so far and every batch has been delicious: chocolatey, rich, and naturally sweet. If you don’t have maple syrup/agave or don’t want to use it, I’ve added a equivalent amount of water to help the dough stick together with great results. I recommend adding a pinch of salt. I also skip rolling into balls by rolling the dough out between two layers of parchment paper and then cutting with a pizza cutter. Enjoy! Thanks for the 5 star review and glad this is a favorite of yours!